Modern Vocal Score Bar Lines are a concept that many students struggle with. To add the bar line all the way through the score or NOT to add the bar line all the way through the score... that is the question! In Advanced Rudiments, students are introduced to Modern Vocal Score (Page 113). Unless you have sung in a choir, there is a good chance that you have never seen Modern Vocal Score. 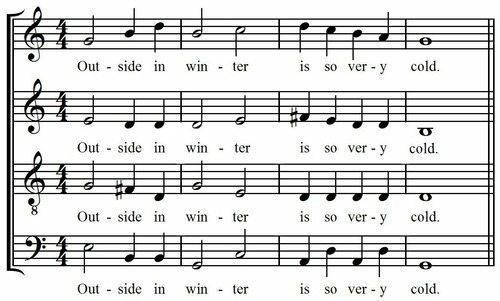 So here are some Ultimate Music Theory Tips to remember how to write Modern Vocal Score Bar Lines - with and without lyrics - in Open and in Short Score. The Modern Vocal Score Bar Lines will line up evenly vertically, as will each beat. This is very important, and it definitely makes a conductor's job easier. Option #1: (Recommended) The Modern Vocal Score Bar Lines are written on each individual staff (and not completely through the Open Score). Option #2: (Acceptable) The Modern Vocal Score Bar Lines are written from the top of the highest Treble Staff straight through to the bottom line of the Bass Staff (as shown in the above example). In Short Score, the lyrics are written in the middle of the Grand Staff. Modern Vocal Score Bar Lines are written on each individual staff (and not completely through the Grand Staff). Option #1: (Recommended) The Modern Vocal Score Bar Lines are written on each individual staff (and not completely through the Grand Staff). 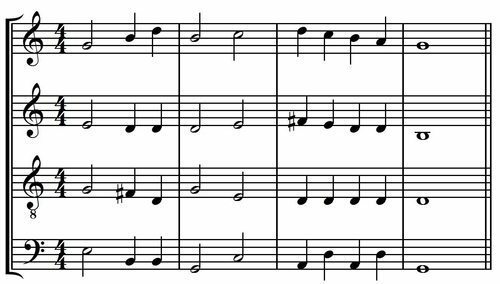 Option #2: (Acceptable) The Modern Vocal Score Bar Lines are written from the top of the Treble Staff straight through to the bottom line of the Bass Staff (as shown in the above example). Play these examples with your student. Have them play the Soprano Voice with their Right Hand and the Alto Voice with their Left Hand. Then you play the Tenor Voice with your Right Hand and the Bass Voice with your Left Hand. When drawing Modern Vocal Score Bar Lines, use your UMT Ruler. This ruler clips in to the Workbook (and the Answer Book). It is clear, so you can see the music underneath the ruler. Do you have students who are ready to start Advanced Rudiments? 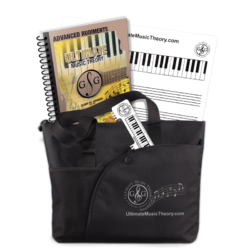 Get them the Advanced Music Theory Student Pack - it contains everything that your Advanced Theory Student will need. P.S. 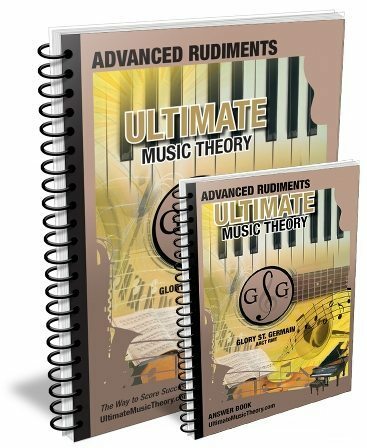 If you are preparing for the Advanced Rudiments Exam - be sure to get the Advanced Rudiments Exam Pack too!